Developer Quote: "CloudOn lets you use your iPad to create, view, and edit files directly in Microsoft Word®, Excel® & PowerPoint®." 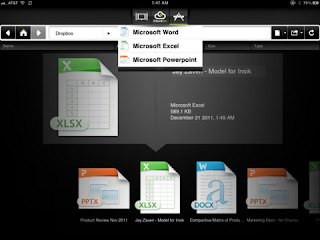 - Use Microsoft Word, Excel and PowerPoint on your iPad to create or edit documents. On opening CloudOn, you are required to enter your DropBox account info or sign up for a new account as this app must use Dropbox to function. Files will be saved using your Dropbox account. The bonus is that your files are available whenever and wherever you need them. I tried both creating and editing Word and Excel files. All the toolbars and functions I would use on my computer were available to me, and working with my docs was a cinch. There is a helpful demonstration prior to using the app on where to find the tools you need to get things working. Additionally, the Help center at cloudon.com fills in all the blanks should you have any questions. In reality, CloudOn is rich with features, simple to use and a real bonus to my work habits and flexibility in producing docs at any time. 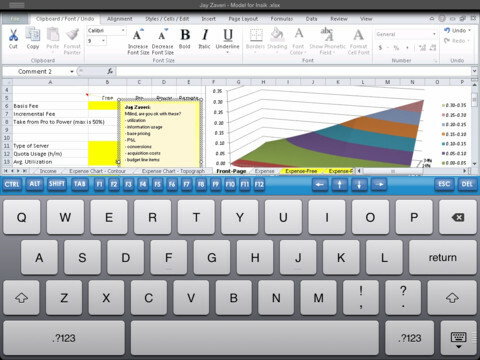 COOL CONCLUSION: "CloudOn uses Microsoft Office functions to create, edit and view documents neatly and efficiently on your iPad."